The College celebrated a major addition to the College’s academic and learning life on Wednesday 7th November with the opening of the new Nagle Library. The restoration of the library spaces was funded by a generous bequest made by one of Australia’s great jurists, and St John’s alumnus, Justice John Nagle. Auxiliary Bishop of Sydney, the Most Reverend Terence Brady blessed the library and NSW Minister for Education the Hon. Rob Stokes addressed approximately 100 guests at the opening of the new facility. The Library and the Philosophical Room at its entrance are at the heart of William Wardell’s original vision of three spaces arranged in a triangle around the staircase: Chapel, Hall and Library. The bequest of John Nagle has enabled the restoration of the library within the space that Wardell originally designed for it nearly 160 years earlier. “John Nagle, who died in 2009, gave two gifts to the College in his Will; one was for a Window in the Chapel depicting John Henry Newman and the other for purposes connected with the library,” said Rector of St John’s College, Adrian Diethelm. “The works undertaken have included the restoration of the Philosophical Room including the ceiling and ‘Frieze of the Prologue’ with verses from St John’s Gospel. “Next door the Reading Room has been fully renovated with the inclusion of a mezzanine level looking out to the University campus and to the city beyond, and facilities for students including study areas and pods. “The Library will house the College’s unique collection of historical and current books as well as providing new spaces for learning and academic endeavour. 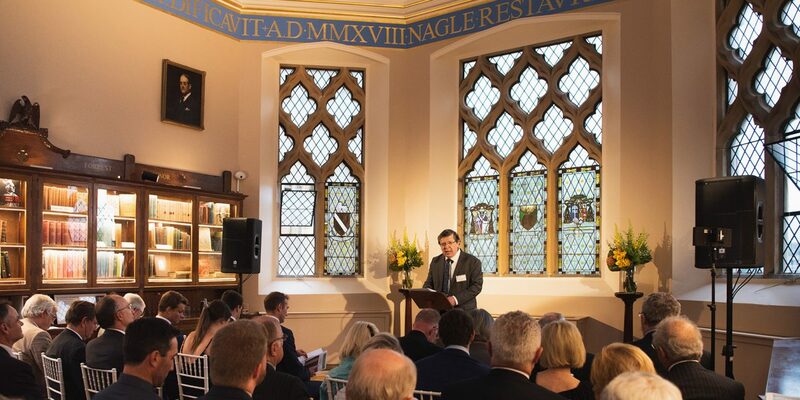 “The generosity of the Nagle Family is very much now a part of the physical fabric of the College with the new Library joining other important bequests including windows in the College Chapel. “We are very grateful to the Nagle Family for this outstanding contribution to the learning environment at St John’s College for students now and well into the future”, said Mr Diethelm.